Interested in Exterior Painting? Learn How to Choose a Color! Standing out in your neighborhood is not always such an easy task. Lawn ornaments, potted plants and a nice decorative mailbox may help your home stand out, but there’s nothing quite like giving your home a fresh coat of paint. Instead of settling for the color that was already present when you moved in, why not show the neighborhood that you too can add a creative splash to the community? If you feel intimidated by exterior painting, don’t worry. Once you know what color to choose, a professional is ready to make it become reality. Here are five key tips to choosing the right color. 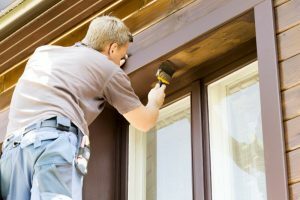 Painting your home’s entire exterior is no easy task to back out of, so you’ll want to make sure you’ve done plenty of research on what the most common colors out there are. For example, you wouldn’t want to choose your first color without considering your other options. Additionally, you don’t want to give blind trust to friends or family members who don’t know anything about color selection. While there are many to choose from, avoid getting distracted by color selection paralysis. Once you find a color that meets all of your needs, make the commitment then. As part of your color selection, you’ll want to make sure you know exactly what it is you’d like to accomplish. While most homeowners paint their exterior in order to stand out, some go the opposite route and paint their home so it blends in more effectively. This should be one of the first decisions you make as you pressure your many color options. Depending on where you live, you may want to paint your home a color that doesn’t stand out too dramatically within the context of your neighborhood. There’s nothing wrong with standing out, but take note of the rest of the surrounding homes and see how conservative their home exteriors are beforehand. Assuming that you don’t want to cover every single inch of your home, there are going to be some areas that you’re going to need keep the same color. For example, the roof, chimney, front or back porch, columns, front door, window shutters and many other parts of your home can all be left alone or modified to complement your home’s exterior. Finally, you should never be afraid to get a professional’s perspective, especially when considering a project as ambitious as your home’s exterior. When speaking with an expert from a painting company, you can utilize their color consultation services. They can also offer you a free quote if you would like to get the job done more quickly. Choosing a color requires patience, but it’s always worth it in the end. Contact a local painting company today to gain valuable insight for your decision! The experts at Platinum Painting put all of their focus on residential homes, including exterior and interior color consultations and painting services. They can help you choose a color, prepare your home for painting, and make sure it looks incredible by the end. To receive a free quote for your next exterior painting project, you can contact them through their website. Comments Off on Interested in Exterior Painting? Learn How to Choose a Color!